It is not often that one has the opportunity to break the siege of Gaza without getting into the crosshairs of the Israeli navy. 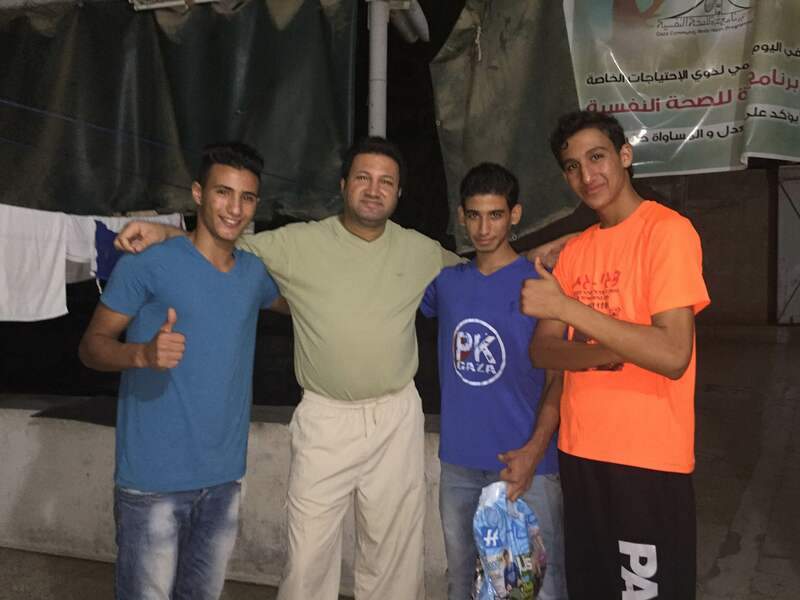 On March 25th of this year while on a medical delegation organized by Washington Physicians for Social Responsibility, I had the extraordinary experience of seeing a performance by the Gaza Parkour and Free Running group in the bombed out wreckage of Beit Hanoun and Shejaia in northern Gaza. 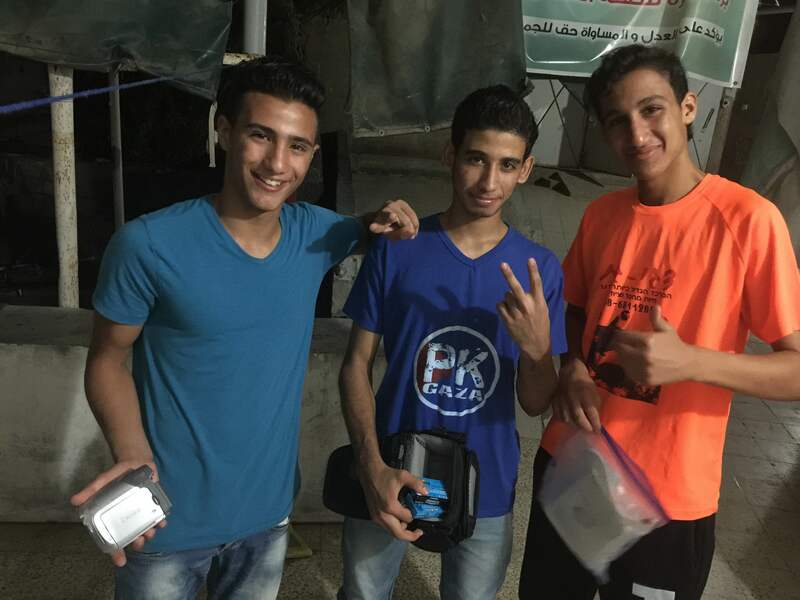 The young men explained that they really need a video camera to record their remarkable feats and share and compete with other Parkour groups outside of Gaza, especially in France. I mentioned this at one of my talks and a friend in the audience said he had a new camera which he was not using and happy to share. I bought a universal charger for the battery, and when I was in Seattle a few weeks ago, I met up with Marwan Diab from Gaza Community Mental Health Program. After a visit with his mother in Canada and friends in Seattle, he was on his way to the airport for the endless flight home. 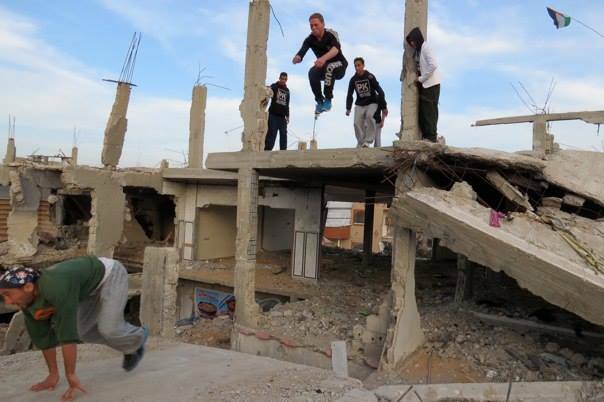 He took the camera and brought it back to Gaza and got it to the Parkour group who sends the following photos and thanks! I return to Marna House and join some of the delegates for a drive to Beit Hanoun, the northern most city tucked into the eastern shoulder of Gaza, just adjacent to the Israeli border, ie., not a good place to be these days. We drive through death defying traffic, a constant game of playing chicken with folks who already feel they have nothing to lose. There is pavement and rocky dirt roads, donkeys trotting along with massive piles of grasses, flowers, and produce, multiple rotaries, mountains of rubbish. We pass Salahadine Street, a route thousands of years old from Morocco to Turkey, industrial areas, a huge building with bags of cement (Gaza gold), sheep trundle across the road, there is a bombed out juice factory, (juice? really?) massive bomb craters and piles of harvested rebar that is painstakingly straightened and reused. Everywhere Palestinians are living their normal lives, going to school, in the markets, walking the streets, sweeping the dust, mundane life goes on despite the post-apocalyptic surroundings. We pass one of the UNRWA schools being used as a shelter, clothes and rugs, hanging from the balconies, the smell of unwashed bodies. There are 29 of 89 UNRWA schools still be used as emergency housing. I will not attempt to put into words the experience of walking into a nightmare, massive amounts of concrete rubble, floors collapsed onto each other, bomb craters many stories deep, in every direction. Young children clamber over this military jungle gym, living on the edge of serious injury and death. The eleven young men seem unfazed and soon, totally against my better judgment, I am holding on to the powerful hands of various young men, hosting my aching back and tired knees onto a ragged pile of rubble so that we all can have an excellent view of incredibly brave, athletic Gazans leaping across shattered roofs, tumbling and twisting through the air to precarious landings covered with rock fragments and jutting rebar. Their skill and energy is captivating, their hands are soon oozing blood. They explain that when they jump, they feel like birds, forgetting the war, exercising their positive male power, connecting with Parkour groups all over the world.